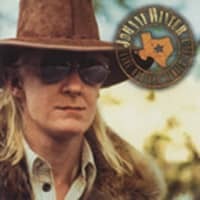 In February of 1969, Johnny Winter signed with Columbia Records for a record sum of $500,000 and gained worldwide fame seemingly overnight (even though his recording career started in 1959). 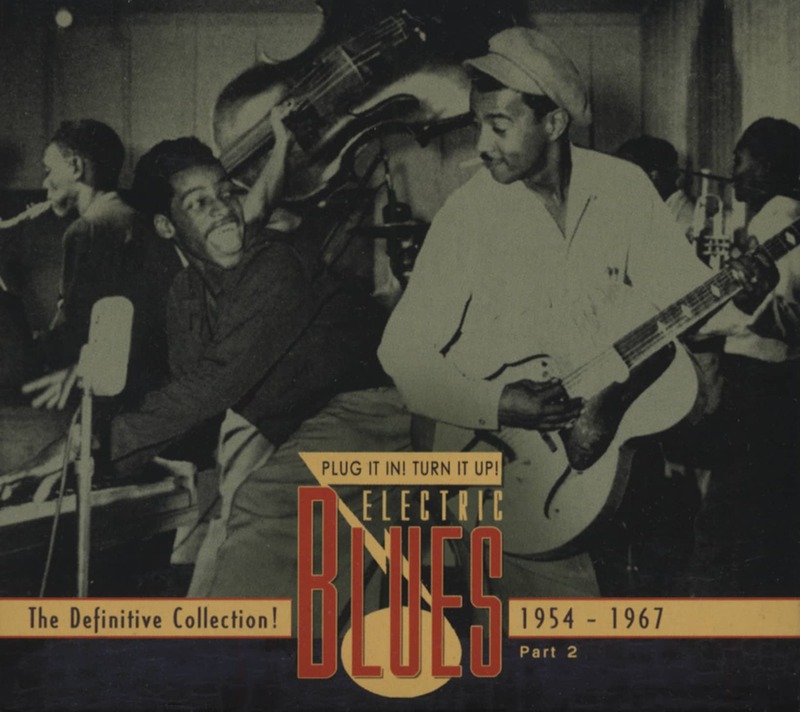 An ensuing rush to cash in on Winter's fame resulted in countless hodgepodge compilations of his pre-Columbia recordings with inferior sounding dubs and mixes. 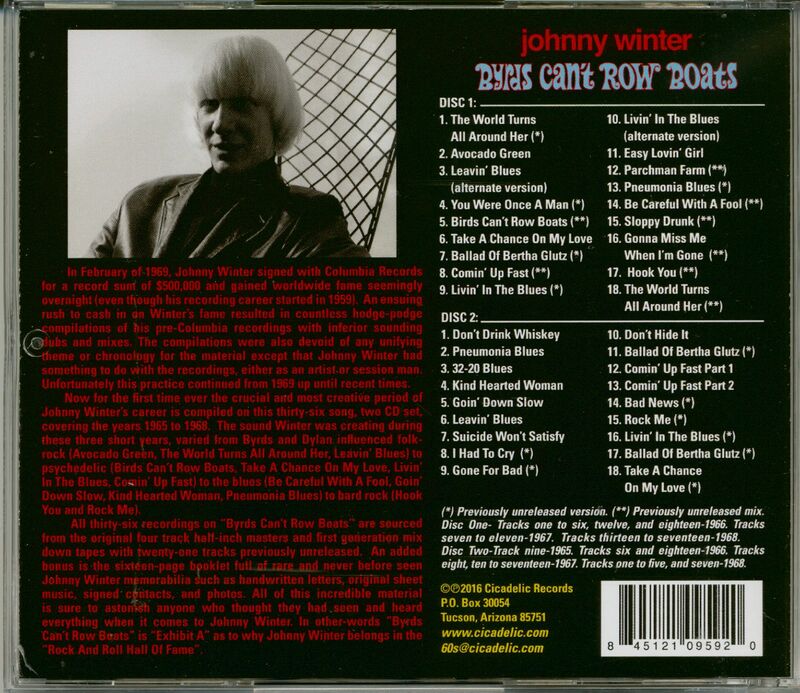 The compilations were also devoid of any unifying theme or chronology for the material except that Johnny Winter had something to do with the recordings, either as an artist or session man. Unfortunately this practice continued from 1969 up until recent times. 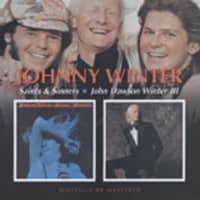 Now for the first time ever the crucial and most creative period of Johnny Winter's career is compiled on this thirty-six song, two CD set, covering the years 1965 to 1968. The sound Winter was creating during these three short years, varied from Byrds and Dylan influenced folk-rock (Avocado Green, The World Turns All Around Her, Leavin' Blues) to psychedelic (Birds Can't Row Boats, Take A Chance On My Love, Livin' In The Blues, Comin' Up Fast) to the blues (Be Careful With A Fool, Goin' Down Slow, Kind Hearted Woman, Pneumonia Blues) to hard rock (Hook You and Rock Me). 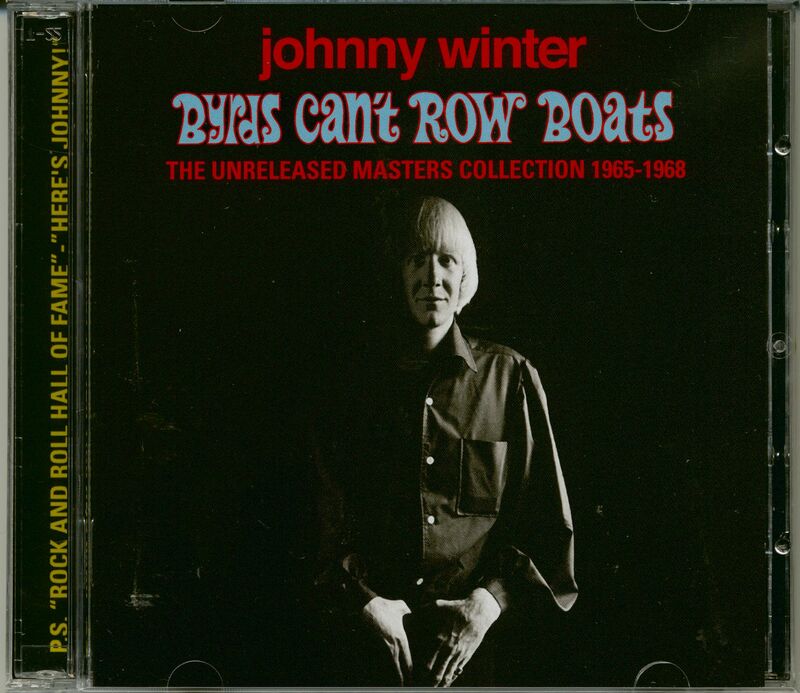 All thirty-six recordings on "Byrds Can't Row Boats" are sourced from the original four track half-inch masters and first generation mix down tapes with twenty tracks previously unreleased. 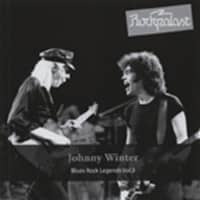 An added bonus is the sixteen-page booklet full of rare and never before seen Johnny Winter memorabilia such as handwritten letters, original sheet music, contracts, and photos. 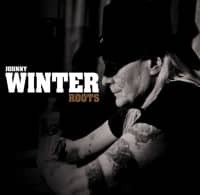 All of this incredible material is sure to astonish anyone who thought they had seen and heard everything when it comes to Johnny Winter. In other-words "Byrds Can't Row Boats" is "Exhibit A" as to why Johnny Winter belongs in the "Rock And Roll Hall Of Fame". 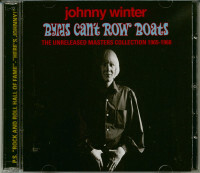 Customer evaluation for "Byrds Can't Row Boats (2-CD)"